Syngman Rhee, or Lee Seungman or Yee Sung-man (March 26, 1875 – July 19, 1965), was the first president of South Korea. As a young man, he studied in the United States at George Washington University, Harvard, and Princeton University. Because of his nationalist activities against the Japanese occupation of Korea, he was forced to live in exile in Hawaii and Shanghai. He served as president of the Korean Provisional Government in Shanghai, from 1920-1925, until he was expelled by Kim Ku, whereupon he lived in Hawaii. From 1934 until 1944, he campaigned in New York and Washington D.C., trying to win international support for Korean independence. 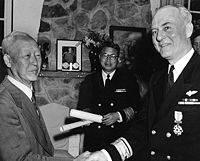 After World War II, General MacArthur ordered him to be brought from America, since Syngman Rhee was the Korean leader most familiar to the United States. Rhee campaigned for the immediate independence and unification of Korea and soon built up a mass political organization. Rhee was elected the first president of South Korea on May 10, 1948, by a parliamentary vote, and he was re-elected in 1952, 1956, and 1960. His presidency, from August 1948 to April 1960, remains controversial because of his authoritarian government. Rhee was a strong anti-Communist, and led South Korea through the Korean War. His presidency ended in resignation following protests against a disputed election. He died in exile, in Hawaii. Following the invasion of Korea by Chinese, Japanese, and Russian forces during the Sino-Japanese War (1894–95) and Russo-Japanese War (1904-1905), a struggle began for influence in the Korean peninsula. Russia, at first, seemed to be coming out ahead; the Russian consul in Seoul, Karl Ivanovich Weber, developed a personal friendship with King Gojong, and after the assassination of Queen Min, personally offered him refuge in the Russian Legation. However, after the Russo-Japanese War (1904–05), Gojong was pressured instead to accept pro-Japanese advisers to the royal court by the Meiji Emperor of Japan. His domestic and foreign policies proved to be successful in the face of Japanese pressure. Gojong played the rival Russian, Japanese, and Chinese against each other to prevent each of them from gaining complete control of Korea. In 1897, Gojong proclaimed the Korean Empire to emphasize that Korea no longer accepted the status of a tributary of China. Following the Protectorate Treaty of 1905, between Korea and Japan, which stripped Korea of its rights as an independent nation, Gojong sent representatives to the Hague Peace Convention of 1907, in order to try and re-assert his sovereignty over Korea. Although the Korean representatives were blocked by the Japanese delegates, they did not give up, and later held interviews with newspapers. One representative warned forebodingly of Japanese ambitions in Asia: "The United States does not realize what Japan's policy in the Far East is and what it portends for the American people. The Japanese adopted a policy that in the end will give her complete control over commerce and industry in the Far East. Japan is bitter against the United States and against Great Britain. If the United States does not watch Japan closely, she will force the Americans and the English out of the Far East." As a result of this statement, an enraged Meiji government forced Gojong to abdicate in favor of Gojong's son, Sunjong. Rhee was born March 26, 1875, in Hwanghae Province to Rhee Kyong-sun, a member of an impoverished aristocratic yangban family. Rhee was descended from Prince Hyo-nyong, the second son of King Taejong of Joseon. Rhee received a traditional classical Confucian education and then enrolled in a Methodist school, where he studied English. He became a nationalist and in 1895, helped to organize the Independence Club to oppose the corrupt Yi government and assert Korean independence. In 1898, the club was destroyed by right-wing opponents, and Rhee was jailed for treason until 1904. While in prison, he became a Christian. In 1904, the Yi government selected Rhee, because of his knowledge of English, to go to the United States in order to implement the United States-Korea Friendship Treaty signed in 1885. In 1905, Rhee Syngman met Theodore Roosevelt in Washington, and pleaded in vain for American support for Korean independence. He obtained several degrees, including an A.B. from George Washington University in 1907, and a Masters from Harvard in 1909. He became so Westernized that he began writing his name in the Western manner, with the personal name preceding the family name. In September 1908, Rhee submitted a neat, handwritten, letter to the officials of Princeton University pleading for special consideration for his "extreme poverty" and expressing his desire to obtain a PhD before his scheduled return to Korea in 1910. Princeton granted his wishes in a letter dated October 2, 1908, and waived his tuition. The Princeton Theological Seminary offered him free room and board on the assurance that he would return to Korea and spread the Gospel. Rhee received his PhD from Princeton in 1910. Rhee had not been a good student, barely passing the seven classes he took at Princeton. His thesis, "Neutrality As Influenced by the United States," was rejected at the first reading, but accepted in May, 1910, "on condition that the last part be put into as good condition as the first." Rhee, who could not raise enough money to bind and publish his thesis as required by Princeton, was given one year to comply with this rule. In mid-1910, Rhee returned to Korea, where he lived at the Seoul YMCA and worked as a teacher and a Christian missionary. Korea had by this time been annexed by Japan, and his political activism attracted unwelcome attention from the occupying army. Rhee left for China in 1912, and emigrated to Hawaii, where he took a position as headmaster of a Methodist school, The Korean Christian Institute, Honolulu, Hawaii. There, in 1913, Rhee founded and edited the Korean Pacific Magazine. On April 8, 1919, the Korean Provisional Government (KPG) was established in the French Concession of Shanghai, and Rhee Syngman was elected president in absentia. Yi Tong Whi (later, Premier) was made Defense Minister, and Kim Kyu Sik, Foreign Minister. The KPG maintained a parliament, press, and a military school in Shanghai. Its original members represented a broad spectrum of Korean political ideologies united by the common cause of Korean independence. On September 23, 1919, General Yi Tong Whi took over the Premiership of the Korean Provisional Government in Shanghai, and filled the leadership positions in the KPG with fellow members of the Korean People's Socialist Party. Yi's effort to regroup the KPG into a united front failed, however, and the exiles split into two primary groups: Yi's group, who favored military actions with Soviet backing, and Rhee Syngman's group which favored working closely with America through diplomatic channels. On December 8, 1920, Rhee Syngman arrived in Shanghai. On January 26, 1921, Shanghai, the Korean Provisional Government split openly. Rhee's faction erupted in hostility toward General Yi, who left the KPG amid accusations of corruption and mismanagement. Dissension continued in the KPG. In 1925, Rhee was impeached by the Provisional Assembly for the misuse of his authority. Kim Ku accused Rhee Syngman of embezzlement, expelled him from the KPG, and took over as President. Rhee returned to Hawaii, where he continued to agitate for Korean independence. Early in the 1930s, Rhee decided to seek financial support from the Soviets. On the train to Moscow, Rhee met a young Austrian woman, Francisca Donner. Rhee was refused entry to the Soviet Union and returned to Hawaii disappointed. He kept in touch with Francisca Donner, and on October 8, 1934, they were married in New York City. Rhee spent the next ten years in New York and Washington D.C., trying to win international support for Korean independence. 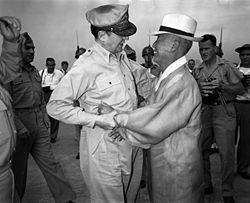 General of the Army Douglas MacArthur, Supreme Commander for Allied Powers, (Left) and Dr. Syngman Rhee, Korea's first President, warmly greet one another upon the General's arrival at Kimpo Air Force Base, at the invitation of President Rhee on August 15, 1944. After World War II, when the government of the United States was seeking a suitable candidate for the Korean presidency, Rhee Syngman was the only Korean leader well-known to them. General MacArthur asked Chiang Kai Sek to recommend a Korean leader, and was given the names of Kim Ku and Rhee Syngman. On October 12, 1945, General MacArthur ordered Syngman Rhee to be brought from America. He returned to Korea ahead of the members of the Korean Provisional Government. Macarthur ordered General Hodge, who was in charge of Korea, to treat Rhee with respect and support him as the leader of Korea. Rhee campaigned for immediate independence and unification of Korea, and soon built up a mass political organization supported by members of the police and strong-arm squads. A number of the major moderate leaders were assassinated. Rhee was elected the first president of South Korea on May 10, 1948, by a parliamentary vote, defeating Kim Koo, the last president of the Provisional Government, by a count of 180-16 after left-wing parties boycotted the election. On August 15, 1948, he formally took over power from the U.S. military and de jure sovereignty of Korean people from the Provisional Government. As president, Rhee assumed dictatorial powers even before the Korean War broke out in 1950. He allowed the internal security force, under his right-hand man, Kim Chang-ryong, to detain and torture suspected Communists and North Korean agents. His government also oversaw several massacres, including one on the island of Jeju in response to an uprising by leftist factions. Rhee did not tolerate domestic opposition. He purged the National Assembly and outlawed the opposition Progressive Party. Rhee controlled appointments to all positions of influence, including village headmen and mayors, and chiefs of police. The United States army began to withdraw from Korea in June 1949, apparently not considering the area to be strategically important. Secretary of State Dean Acheson argued that if South Korea was attacked,"The initial reliance must be on the people attacked to resist it and then upon the commitments of the entire civilized world under the Charter of the United Nations." At dawn on June 25, 1950, the North Koreans launched a surprise attack on South Korea, supported by China. Three days later, communist forces captured the South Korean capital, Seoul. Rhee damaged his reputation by encouraging the citizens of Seoul, the nation's capital, to remain in the city while he himself was already on his way to refuge as war broke out. His decision to cut the bridges on the Han River prevented thousands of citizens in the north from escaping Communist rule. The Security Council of the United Nations recommended sending troops to defend South Korea. The Soviet Union was boycotting the Security Council and was unable to veto this decision. Fifteen nations sent troops to Korea, under the command of General MacArthur. The North Koreans had occupied all of the South except for the area around the port of Pusan. On September 15, 1950, MacArthur landed American and South Korean marines at Inchon, two hundred miles behind the North Korean lines. The following day he launched a counter-attack on the North Koreans. When they retreated, MacArthur's forces followed the retreating North Korean forces northwards, reaching the Yalu River, the frontier between Korea and China on October, 24, 1950. While the United States government remained undecided on whether to proceed any further, the Chinese government sent 180,000 troops to reinforce North Korea, enabling them to take Seoul for a second time in January 1951. U.N. troops eventually halted the invasion sixty miles south of the 38th parallel and recovered lost ground with a counter-offensive at the end of January. Once in control of South Korea, representatives of the United Nations began peace talks with the North Korean government on July 8, 1951. An armistice agreement, maintaining the divided Korea, was signed at Panmunjom on July 27, 1953. Rhee became unpopular with his allies for refusing to agree to a number of ceasefire proposals that would have left Korea divided. Hoping to become the leader of a united Korea, with U.N. assistance, he tried to veto any peace plan that failed to eliminate the northern government completely. He also argued for stronger methods to be used against China and often expressed annoyance at the reluctance of the United States to bomb it. On January 18, 1952, Rhee declared South Korean sovereignty over the waters around the Korean peninsula, in a concept similar to that of today's exclusive economic zones. The maritime demarcation thus drawn up, which Rhee called the "Peace Line," included Liancourt Rocks and Tsushima Island. Throughout his rule, Rhee sought to take additional steps to cement his control of the government. In May 1952 (shortly after being elected to a second term), when the government was still based in Busan due to the ongoing war, Rhee pushed through constitutional amendments which made the presidency a directly-elected position. In order to do this, he declared martial law and jailed the members of parliament whom he expected to vote against it. Rhee was subsequently elected by a wide margin. He regained control of parliament in the 1954 elections, and thereupon pushed through an amendment to exempt himself from the eight-year term limit. Rhee's prospects for re-election during the presidential campaign of 1956 initially seemed dim. Public disillusionment regarding his attempt to seek a third term was growing, and the main opposition candidate, Shin Ik-hee, drew immense crowds during his campaign. Shin's sudden death while on the campaign trail, however, allowed Rhee to win the presidency with ease. The runner-up of that election, Cho Bong-am of the Progressive Party, was later charged with espionage and executed in 1959. By 1960, Rhee already served three terms in office. Over the years his regime had come to be regarded as authoritarian, corrupt and inefficient. Rhee’s victory in the 1960 elections was assured when the main opposition candidate, Cho Byeong-ok, died shortly before the March 15 elections. Rhee won with 90 percent of the vote. The real contest was in the separate race for vice president. Rhee's heir apparent, Yi Gi-bung, was declared the victor in an election that the opposition claimed was rigged, sparking angry protests among segments of the Korean populace and the student-led April 19 Movement forced Rhee to resign on April 26. On April 28, a DC-4 belonging to the CIA-operated Civil Air Transport whisked Rhee out of South Korea and away from the clutches of a lynch mob that was closing in. Kim Yong Kap, Rhee's Deputy Minister of Finance, revealed that President Rhee had embezzled $20 million in government funds. Rhee, his Austrian-born wife, Francisca Donner, and adopted son lived in exile in Honolulu, Hawaii, until Rhee died of a stroke on July 19, 1965. His body was returned to Seoul and buried in the National Cemetery on July 27 of the same year. Rhee's legacy has been in considerable dispute. In general, conservative circles regard Rhee as the patriarch of the nation, while liberals tend to be critical of him. Rhee's former residence in Seoul, Ihwajang, is currently used as a presidential memorial museum, and the Woo-Nam Presidential Preservation Foundation has been set up to honor his legacy. ↑ M. Volkov Русские в Корее—имена и судьбы (Russians in Korea—Names and Fates). Retrieved November 10, 2007. ↑ www.hartford-hwp.com, Who Was Rhee Syngman? Retrieved November 10, 2007. ↑ Christopher Buyers, The Yi Dynasty. Retrieved November 10, 2007. ↑ www.kimsoft.com, Who Was Rhee Syngman?. Retrieved November 10, 2007. ↑ Spartacus, Syngman Rhee. Retrieved November 10, 2007. Allen, Richard C. 1960. Korea's Syngman Rhee, an Unauthorized Portrait. Tokyo: C.E. Tuttle Co.
Douglass, Paul. 1959. Syngman Rhee's Republic. Korea (South). 1954. Syngman Rhee Through Western Eyes. Seoul: Office of Public Information, Republic of Korea. This page was last modified on 10 November 2015, at 17:12.